Have you ever encountered this landscaping challenge? This blank wall is rather boring, and the home behind it dominates the view. So what would you do to fix these problems? I faced this dilemma last month at a client’s home. The pool was the main focal point of the landscape, and the dull wall wasn’t doing it any favors. In coming up with a solution, we had to select a plant that was relatively low-litter, due to the proximity to the pool and that looked attractive throughout the entire year because of the high-profile location. 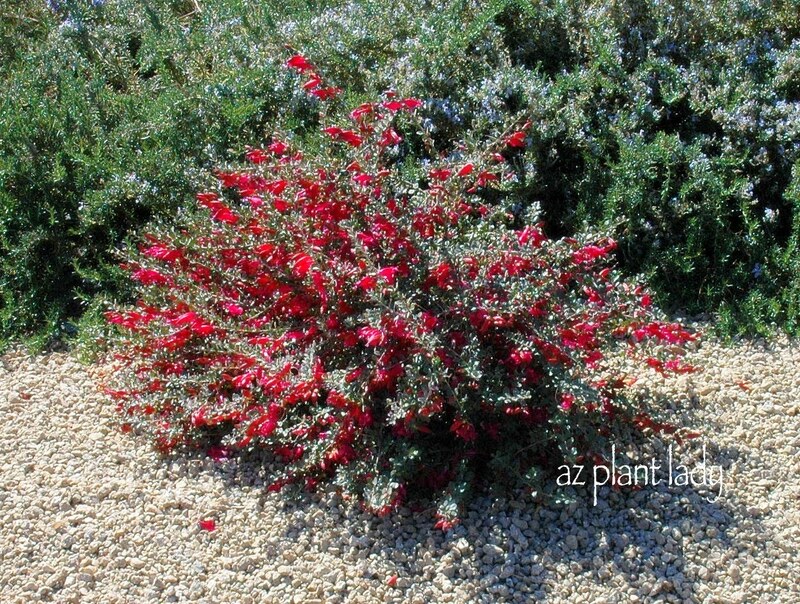 I recommended adding three hop bush (Dodonaea viscosa). 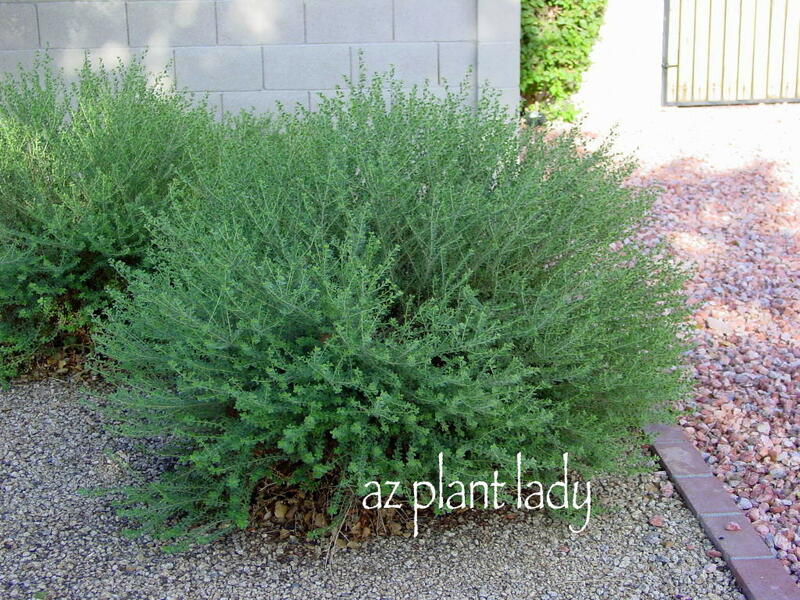 These are tall, evergreen shrubs that thrive in arid climates such as ours. One of the many things that I love about them is their versatility. They thrive in full sun and light shade, and can be allowed to grow up to 12 feet tall, or maintained at a lower height. For the area behind the pool, I recommend having it grow to its full height, which will help provide privacy while the attractive foliage will add a welcome screen of green throughout the year. Hop bush does produce light green, papery flowers in spring, but they aren’t particularly showy. So, we need to add a color element to the area behind the pool. One of my favorite ways to add color to any landscape is to incorporate brightly colored containers in shade of blue, purple, or orange. That way, whether plants are in bloom or not, there is always a bright splash of color. For this area, I recommended adding 3 blue pots, equally spaced. Now it was time to decide what to plant in each pot. The client wanted a low-maintenance choice that wouldn’t require a lot of water. Immediately, I remembered touring a landscape that had blue containers filled with ‘Blue Elf’ aloe. Even though the aloe had finished blooming for the year, their spiky blue-gray foliage added nice color contrast. This small aloe is one of my favorite succulents for several reasons. 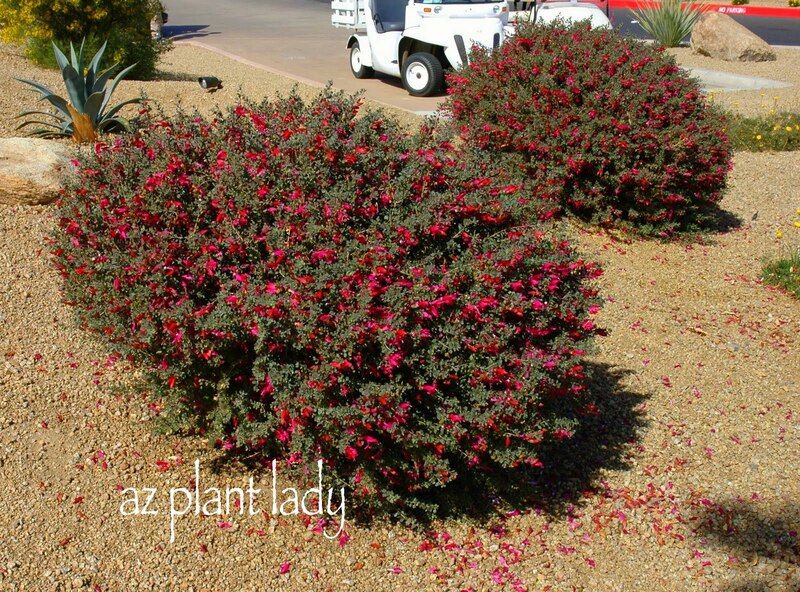 First, it begins to bloom in late winter, lasting into spring adding welcome color to cool-season landscapes. Hummingbirds can’t resist the flowers either. This aloe is best showcased when grouped together and thrives in full sun, unlike most aloe which prefer filtered shade. Finally, it is hardy to 15 degrees F. so cold winters seldom bother it. And so, here is the planting that I suggested to my client that will provide year round beauty and privacy. *Do you have a favorite plant or group of plants that you like to use against bare walls? 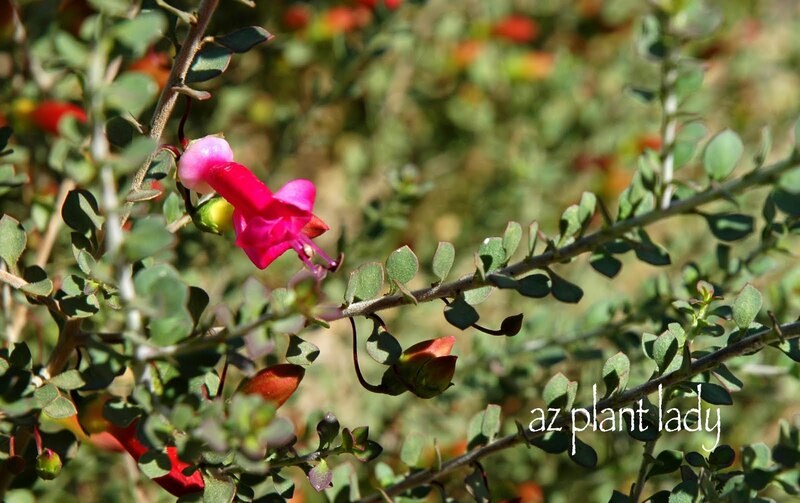 Did you know that some flowering, desert perennials are grown easily from seed? It’s true. Many of the plants in my garden are volunteers that grew from seed from my established plants. I have several ‘parental’ plants in my front garden along with their babies that have come up on their own with no assistance from me. My favorite perennials that grow from seed are my colorful globe mallow (Sphaeralcea ambigua). The most common color seen in globe mallow is orange. However, they also come in other colors such as red, pink, and white. You can purchase the less common color varieties, but they can be hard to find at your local nursery. When I first designed my garden, I bought pink, red, and white globe mallows. These plants are now over 17 years old and produce a large number of seeds once flowering has ceased. Because these colors can be hard to find, people ask me to sell them seeds that I harvest each year from my colorful perennials. Harvesting seeds from spent flowers is easy to do. Once the flowers begin to fade in spring, I look for tiny, dried out seed pods, which is where the seeds are contained. I then pick them off and place them in a little bag. It’s important to keep the colors separate so if someone wants red globe mallow, they won’t be growing pink or white ones. There are other desert perennials that come up easily from seed, such as the ones pictured above in a garden I visited a few years ago. So how do you grow these drought tolerant perennials from seed? Surprisingly, it’s not hard to do, and if you go to a lot of trouble and fuss over them, they probably won’t grow. So starting them in little pots and transplanting them isn’t the best way to go about it. Instead, sprinkle the seed throughout the landscape, allowing some to fall a foot away from a drip emitter or near rocks. You want to mirror the natural conditions where they sow their seed in nature. Warning: this only works in areas where pre-emergent herbicides are NOT used. Growing these perennials from seed is very inexpensive, but some patience is needed while you wait for them to sprout. Not all will come up, but those that do, will add beauty to your garden and before you know it, you may be harvesting seed to share with your friends. What type of plants have you had come up in your garden from seed? The vibrant flowers of firecracker penstemon (Penstemon eatoni) add a welcome splash of color during winter and into spring. People often ask me to post more photographs of my garden on my blog. I must confess that I am sometimes reluctant to do so as I wonder if they expect a ‘perfect’ garden – one that is meticulously maintained and expertly designed. However, I decided that would show you my garden, even if it bursts a few bubbles of what people expect it to look like. The yellow flowers of angelita daisy contrast with the cool colors of purple and white trailing lantana. Gopher plants (Euphorbia rigida) are getting ready to produce chartreuse-colored flowers. The landscape that surrounds my home reflects my love for plants that add beauty without needing much attention from me. I don’t tend to rake or blow my leaves and the plants are allowed to grow into their natural shapes without much interference from me. The fragrant blossoms of feathery cassia (Senna artemisiodes) add visual warmth to the winter landscape. That is important because I am usually so busy helping others with their landscapes, that I often don’t have enough time to fuss over mine. Pruning once, or at most, twice a year is my standard of a fuss-free plant. I love color throughout all seasons. So, you are just as likely to find as much color in my winter garden as in the summer. Green desert spoon (Dasylirion texanum) add spiky texture contrast to the landscape. As for the design of my garden, horticulturists are by nature, collectors of plants. This means that we likely to include many different kinds of plants – often more than you would see in a well-designed garden. I do enjoy designing landscapes and have done my best in designing my own garden, while incorporating a large variety of plants. The leafless canes of an ocotillo will soon leaf out with the arrival of spring. I’ve always felt that a garden should reflect the owner’s personality while also enhancing the exterior of their home. Mine shows my love for color and low-maintenance beauty. What does your garden reveal about you? The pink flowers of Parry’s penstemon (Penstemon parryi) adds welcome color to a spring garden. I adore flowers of all kinds, but I must confess that my favorite types look as if they belong to a cottage garden, which probably explains why I am wild about penstemons. There are many different species of penstemon with varying colors, ranging from shades of pink to red with some white ones thrown in. Firecracker penstemon (Penstemon eatonii) adds vibrant color to a hummingbird demonstration garden. All penstemons are native to the western half of North America where they thrive in well-drained soil. 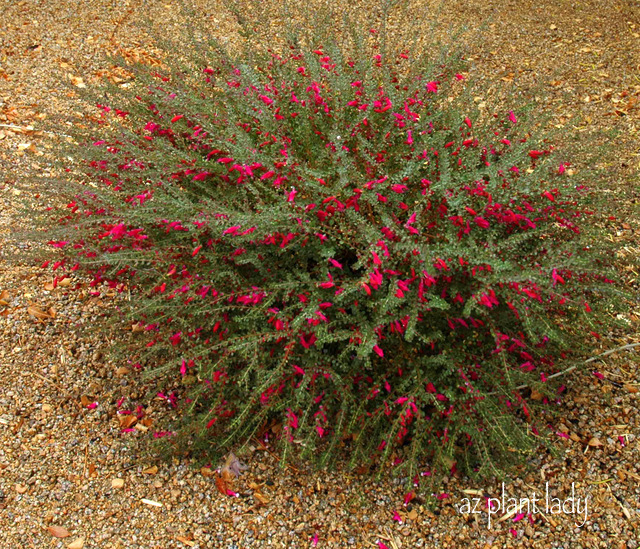 Most grow in higher elevations, and all are drought tolerant. For those of you who love to grow native plants that are low-maintenance, penstemons are a must-have. The 4 – 6-foot flowering spikes of Palmer’s penstemon (Penstemon palmeri) lightly perfume the air of this desert landscape. I like plants that add a touch of drama to my garden and penstemon do a great job at that when they send up their flowering spikes that tower over their lower cluster of leaves. Bees and hummingbirds love their flowers and it is fun to watch their antics as they sneak inside the flowers for nectar. A row of rock penstemon (Penstemon baccharifolius) adds lovely color to this area at the Desert Botanical Garden in Phoenix. While penstemon may look rather delicate, it is anything but as it can survive temperatures over 100 degrees and temperatures that dip anywhere from 15 degrees Fahrenheit all the way down to -30 degrees, depending on the species. The bloom time for penstemon depends on the species as well as the climate they grow in. 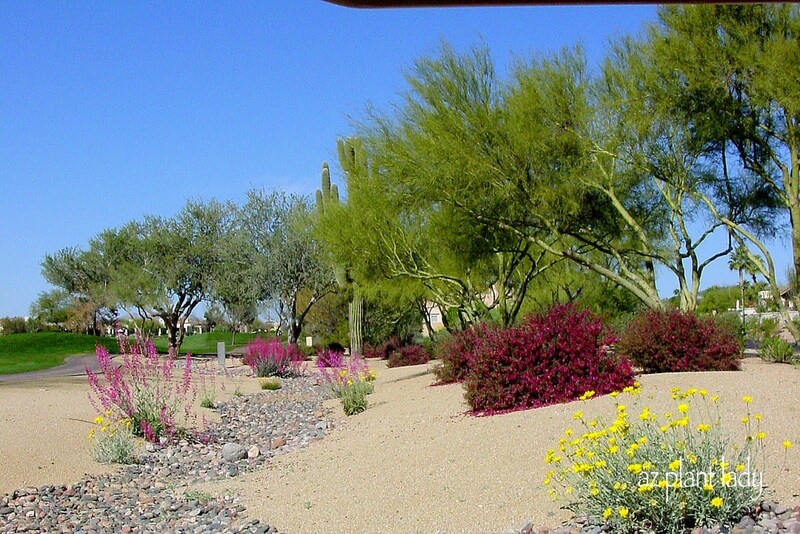 For desert dwellers like me, most bloom in late winter into spring. Each year, I eagerly await the appearance of the first unfolding flowering spikes of my firecracker penstemon (Penstemon eatoni) to emerge in January. In my garden, Parry’s penstemon (Penstemon parryi) is another favorite of mine in the garden, and its flowers begin to open in late February. This year, I am growing pineleaf penstemon (Penstemon pinifolius), which is a new one for me and I am curious to see how it will do. Another penstemon that I am anxious to try is rock penstemon (Penstemon baccharifolius), which blooms spring through fall. Lastly, I have added Palmer’s penstemon (Penstemon palmeri) to my garden. I used to grow it years ago and was happy to incorporate it back into my landscape. It’s important to note that penstemon grows best when grown in the western half of North America. The season in which they bloom can vary depending on the USDA zone. In my zone 9 garden, I begin to appear in January and last through spring. For those who live in colder climates, penstemon will bloom later in spring or even begin flowering in summer. However, no matter when they bloom, penstemon are sure to add beauty to the landscape with a touch of drama. **Do you have a favorite penstemon?